So, today Mrs. Chicken of Chicken and Cheese posted a mullet-tastic photo of herself from the 80s. She needs a laugh. I feel much the same way she does - tons to write about, but I can't get started. I have indeed had a mullet myself, but I don't have any photos of it scanned in. 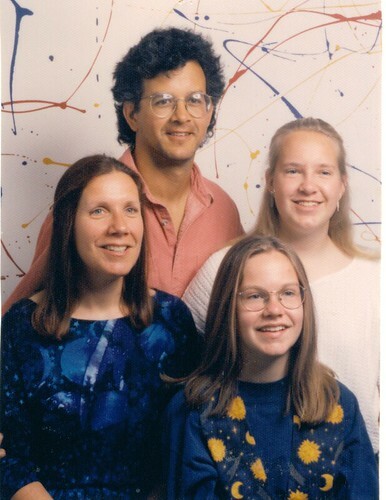 Instead, this one's for you Mrs. Chicken - I really think it might be Awkward Family Photo worthy. Okay, so maybe it's not THAT bad, after actually clicking over to the AFP website for a minute. But I'd like you to note my Mom & sister's weird celestial theme, the vest, my awful white sweater & WTF is up with that weird background? This was probably in 1994 when I was 14. OMG, I just found this one. It's mullet-ish. I was in 7th grade.